Choosing a doctor is a lot like choosing a house. It takes time and patience. It should be more than calling the first name you spot in the phone book. Just as houses are a long-term investment, choosing the right doctor may make a big difference in your long-term quality of life. The best way to avoid becoming the victim of a Missouri medical malpractice is to choose a doctor who is thorough and dedicated to doing a good job. Don't expect a doctor to spend an hour listening to you complain about that pain in your back that just won't go away. Doctors rush from one patient to the next and typically only have a few minutes with each one. Still, a good doctor will use those few minutes wisely to ask you specific questions that will help him or her better assess your condition. A doctor who doesn't ask any questions or who doesn't acknowledge your concerns at all may not be the best doctor for you. Frequently, a good doctor will perform some type of test to confirm his or her hunch of a particular diagnosis. Be wary of a doctor who diagnoses you on the spot and rushes you into treatment with no evidence. Most medical conditions have more than one possible treatment. A good doctor will explain your options and tell you which he or she thinks is best and why. Usually a good doctor will save experimental treatments for particularly complicated cases where other options have been exhausted. 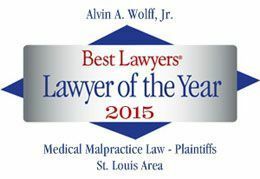 An experienced Missouri medical malpractice attorney can help you recognize the signs of a good (or bad) doctor and determine if you have you potential lawsuit. For a free consultation or to request a free copy of our guide How to Pick a Lawyer, call The Law Office of Alvin Wolff, Jr., and Associates at 877-241-1020.